Munchkin Madness is every Saturday from 11am to 1pm for kids ages 12 and under. Just $15 per person for all you can play laser tag! Plus check out Lazer Camp, which includes mega amounts of world-class laser tag, jump sessions on the indoor trampoline, pizza and more! 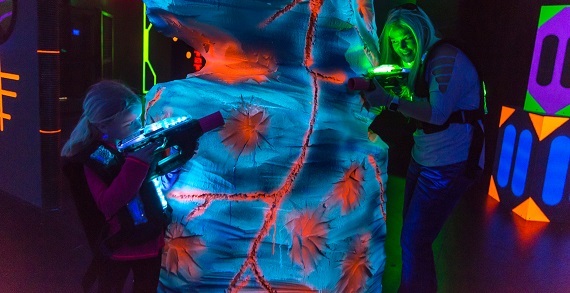 Lazer Kraze, now with two great Columbus locations, features Columbus' largest and only multi-level laser tag arenas. 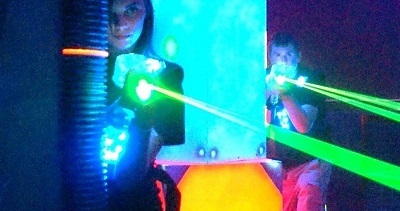 State-of-the-art laser tag gear at both locations with professionally themed arenas make laser tag a BLAST for all ages. In Lewis Center, you’ll also find the Zero Gravity inflatables including jousting, obstacle courses, huge slide and bounce house. In the new Gahanna location we’ve got an Indoor Trampoline Park and Cyber Sport which is a cross between Lacrosse and basketball all while maneuvering your cyber car. Try out the GLOW party for even more fun. Great for birthday parties, group and corporate events! Play in open sessions or ask about private sessions just for your group! See website for guidelines on inflatables, trampoline park, and Cyber Sport.